National Handwriting Day reminds me how lucky I am to have become involved (40 years this fall) in an art form that is so intimately related to handwriting. 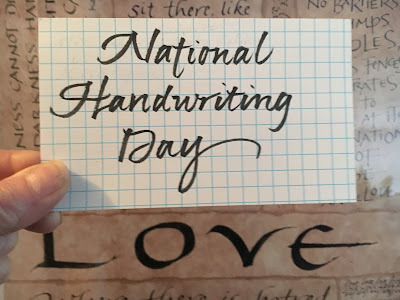 This connection has allowed me to come and go in the serious practice of calligraphy while keeping my hand engaged as I made cards, wrote out recipes, and addressed envelopes. Those years of making letters for personal communication rather than exhibition gave me the freedom I was seeking when calligraphy was my sole focus. Thank you calligraphy and thank you handwriting. You have enriched my life.